A few weeks ago I posted the second scenario in the chaos campaign - the Sorceror Apprentices. My sorceror, Bl'nd the Reckless, faced an Empire army. He rolled two spells from the Tzeentch deck, Baleful Transmogrification and Infernal Gateway. The battle took place in a magic infused landscape, and it did play a big part in the game. The first major event was the Empire wizard casting Metal spells at my knight, obliterating them in turn one! Not the best start in a 1600 point game. With my forces also coming under pressure from Empire handguns and artillery, it was a tough first half. Bl'nd the Reckless lived up to his name, choosing to roll 6 dice at every opportunity. 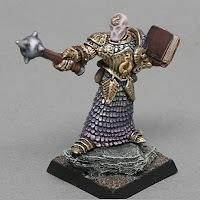 He managed to cast Infernal Gateway a number of times, wiping out several Greatswords, halberdiers and virtually a whole unit of handgunners. His kill tally mounted up rapidly to over 30. Meanwhile, the bulk of the chaos army made it into combat, helped by screens of chaos hounds. With most of the handgunners, the cannons and the wizard destroyed, towards the end of the game it was a simple task for the chaos forces to mop up the Empire stragglers. Greatswords and then halberdiers fell under the onslaught. In the last turn of the game, the remaining unit of spearmen was surrounded by chaos units. But Bl'nd proved too reckless in his quest to prove himself to the Chaos gods. He once again threw 6 dice and up rolled 3 sixes. The miscast saw him sucked into the Realm of Chaos. I could easily have played safe, but got carried away by the aims of the scenario. So in subsequent games I will be severely limited in my magic capability, just a level 1 sorceror lending me aid. However, this is not disastrous, as my opponent's sorceror failed to impress the gods in his game against a Beastmen army. He foolishly got embroiled in a combat, only narrowly avoiding death at the hands of a Wargor, and barely escaped from a unit of rampaging minoaturs. Surrounded and desperate, he miscast and died a pathetic death, so the campaign continues with us both in a similar position. As an aside, it was my first time using a beastmen army and I really enjoyed it, so expect more beastly updates later in the year! I should really be working on my chaos army, but those pesky greenskins have put a spanner in the works. With the imminent release of the new Orc and Goblin book, I thought it was a good time to review my greenskin army. What started as a few night goblins in the Battle for Skull Pass box set has grown into my second biggest army. I have about 1800 points fully painted, and much more hidden away in boxes. It was the latter I decided to rummage through. I knew I had picked up some arrer boyz on ebay in the past, but I had completely forgotten about a large number of orc boyz. They are mostly the two weapon variety, but I already have a unit of those fully painted, so I was hoping I could adapt them to be shield and hand weapon boyz. With a bit of chopping here and there, and with the addition of a couple of boyz sprues, I was able to put together a small unit fairly quickly. In the picture you can see the ebay boyz, they came already sprayed, but with mould lines still visible (why do people do that?) There are also some of the sprue boyz that I assembled. Best of all, there is one huge orc on the left, he will eventually become my army standard bearer. I also have a large number of arrer boyz, spear boyz and more double choppa boyz, so plenty of raw material to work with. And as if that wasn't enough, I would love some of the new savage orcs too. Pesky green blighters, ruining my painting plans! The second scenario is fought over two games, each army's sorceror hoping to prove himself against an army other than Warriors. The Chaos army is to be led by a level 2 sorceror, who may take a mark of chaos and the usual 50 points of magic items (these must be from the chaos book, not the main rulebook). He leads a 1600 point army, which may include special and rare choices, but see the will of the beasts rule below. Enemy army to be chosen by opponent, with no lord characters allowed, just one rare choice. The game is played on a 4x4 table with as many rocky features as possible, 3 being special terrain as detailed below. There should be at least 8 inches space around each rocky area to allow troops movement. Terrain rules. Nominate 3 of the terrain pieces as special terrain:- one is a set of arcane ruins and one is a magic circle as per the main rulebook, the third piece is an altar of chaos. For the altar of chaos, each chaos turn roll a die to see which diety is in the ascendant: - 1 none, 2 Slaanesh, 3 Nurgle, 4 Khorne, 5 Tzeentch, 6 all of them. Any units with the ascendant mark gain +1 on all to hit dice rolls for this turn. Any sorcerors with the ascendant mark gain d3 magic dice and +1 on all magic rolls. End of Game. The game ends at the whim of the gods! From the end of turn 4 onwards, roll a d6 and add it to the turn number, if the total is 10 or more the game ends immediately. Thus, a roll of 6 will end the game on turn 4, a roll of 5 or 6 will end the game on turn 5, etc. Obviously the game ends sooner if the sorceror and/or his army is destroyed. Victory is determined in the usual way, with an additional 10 victory points for each unsaved wound caused by the sorceror in the game. He also gains 10 points for each spell he casts. Once the victory points are added up, the sorceror's fate is decided. If the sorceror wins by more than 500 victory points, he gains the favour of the gods. He becomes a level 3 Sorceror Lord and may make an Eye of the Gods roll, adjusting it by +/- 1 if he wishes. 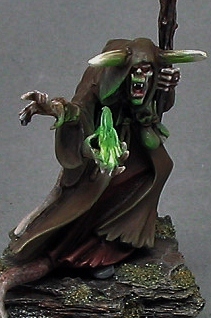 If the sorceror wins by between 100 and 500 victory points, he remains unaffected and may continue to the next game. Any Eye of the Gods rolled during the game are carried forward to the next game. If the scores are within 100 victory points, the game is a draw and the sorceror gains no special reward. Any Eye of the Gods rolled during the game are lost on the dice roll of 1. If the sorceror loses by between 100 and 500 victory points, he attracts the wrath of the gods for his failure. Any Eye of the Gods rolled during the game are lost on the dice roll of a 1 or 2. Also, the sorceror is reduced to level 1 on the d6 roll of 1. If the sorceror loses by more than 500 victory points, he is turned to spawn.